This is a handy guide for first time cannabis growers. Yield per plant is 4 to 6 ounces per plant. This is the organic Blue Dream grow series. if you’re a first time grower, then you can grow right along with me. Alright, so today we’re going to germinate these Humboldt Blue Dream seeds and I’m going to do it the old fashioned way, napkin, sandwich bag nothing special or fancy, just regular household items. I’ve never grown Humbolt seeds before and I really like the packaging, but I had a really hard time getting these seeds out. I ended up breaking it, it’s too bad because the packaging is really nice on the back. It has a brief description of the genetics, the smells, the taste and what to expect from the grow. This pack only came with three seeds. 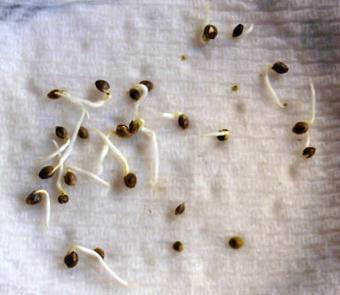 I’m only going to germinate one, my paper towel is nice and damp so I’m going to drop the seed right in the middle, sprinkle some Mycorrhizae on top, fold my damp paper towel over twice and put it inside of a sandwich bag. I love Mycorrhizae. Mycorrhizae is a fungus that attaches to your roots, it creates a symbiotic relationship and mines for nutrients. It feeds your plant, then in turn, your plants give up its sugars and carbohydrates. This is 100% natural, it happens all the time in nature, but it doesn’t happen indoors, so that’s why we’re adding it. Now there’s a lot of companies out there that make Mycorrhizae, I’ve used Mykos in the past with really good results and I’m currently using Root Magic by Blue Planet Nutrients. Getting back to germinating our seeds, we have moisture in a wet paper towel and the sandwich bag is in the trap that it is sort of like a greenhouse all the seed needs to germinate is water and warmth. I’m going to use a heating pad to create the warmth that the seed needs to germinate. I’m going to put it somewhere dark and I’ll comeback and check on this in a few days. Three days later the seed germinated, so that brown stuff you see there that’s Mycorrhizae looks a little gross I know, but trust me it’s good stuff. Alright, so the seedling is going to be transferred over to soil. I’m going to use the regular plastic cup I’ve poked some holes in the bottom and fill it up with Fox Farm soil. I’ve dug a little hole in the soil and sprinkle a little bit of Mycorrhizae in there, I’m going to drop my seed in and cover it I’m going to put the cup underneath the CFL light bulb and check back in the few days. Editor's note: Full spectrum LED or Light emitting diode is the better lighting source. I got my plant underneath of 100 watts CFL light, the light cycle is set to 18 hours light and six hours darkness, so my job for the next few days is to maintain temperature and moisture, that’s it. The serrated leaves are showing and the plants moving along really nicely. The second set of leaves have sprouted now you may have noticed that the color change a little bit - that’s because I switched over to my LED light now the only reason I did this is because I could not maintain the temperature, it was just getting too cold. This new LED it puts out a little bit more heat so I should be okay, it also uses more electricity, so I switched the light cycle to 16. Today I noticed that the plant needed a little bit of water, so I’m going to water using liquid seaweed and molasses mixed into 1 gallon of RO water and pH down to 6.8. The plant is definitely healthy the temperature and could be warmer, but you know it’ll work. The plant is looking healthy and developing at a fair paced the soil is a little dry again - I can tell it needs water because the soil is dry and it’s also lot lighter than it would be if it had water, so I’m going to water the same way again, liquid seaweed, molasses in a gallon of RO water pH at 6.8. The temperature and humidity have been getting better, but you know I always struggle with this ...it’s never perfect. ..the little computer fans are connected to a controller and this is just going to move the air around inside the tent. I’ve gotten really good development and side branching the plants moving along really nicely. The soil is dry again the cup is light, so we’re going to water same way liquid seaweed, molasses mixed into a gallon of RO water pH down to 6.8. It looks like the soil is dry again and I have to water again now as the plants get bigger - the roots fill up the cup, the nutrients get used up and you can keep it in here, but you’re going to have to water a lot more and you’re probably going to have to fertilize. I’m not going to do that, so I’m going to water the same way again and I’m going to transplant this plant out in a few days. Today is transplant day. I buried the cup in the soil when I pull that out it’s going to be the perfect size for my root ball, so now I’m just going to sprinkle some Mycorrhizae in the hole. I’m going to sprinkle some Mycorrhizae on the root ball, and I’m going to drop my plant in. The last thing I’m going to do is water with the same mix at 6.8. Now transplanting is a little stressful to plant and it’s going to take a few days to recover. The plant is moving along at a good pace, lots of sides branching - all the branches are thickening up, thicker branches better support fatter flowers. This plants starting to get a little bushy so to make sure it’s receiving light evenly. I’m going to spin around today quarter turn maybe nothing too drastic. Today I noticed that the edges of the pot are starting to dry out. I’m going to water with liquid seaweed mixed into RO water pH down to 6.6. The plant is moving along nicely it’s growing pretty fast, good branch development, good leaf development inter note spacing is short, it’s doing really good the plants is about 15 and a half inches tall and about 18 inches wide. Oh by the way guys, I picked up some clones from buds and roses about a week ago and I planted them in soil - they’re just starting to settle in, so these are going to be OG’s and purple plants. I’m not going to upload updates on this series because they’re going to have their own series, but you can always follow along on my instagram. So I just recently got a 4 x 8 x 7 grow tent and I’m going to run 2 door lux here I got the autopilot to keep my temperature in check since I’m always struggling with that. I got 2 black op carbon filters the grow tents made by hydro builders it’s a little flimsy maybe I should have gone with the gorilla tents, but we’ll see how this works out. From seed today I moved my plant from my 2 x 4 grow tent over to my 4x8 under the door lux 600. Today is also transplant day for my small clones ... I buried one of those red party cups in the soil and when I pull that out, it’s going to be a perfect hole for my root ball to fit in. I’m going to dust the walls in the bottom of the hole with thin layer of Mycorrhizae ... now I’m going to squeeze around the cup to loosen the root ball. I’m going to flip the cup upside down and it should slide right out, I’m going to sprinkle some Mycorrhizae on the root ball and drop it in the hole, then compress the soil around the roots just a bit and then I’m going to water using RO water, liquid seaweed pH down to 6.8. All right, in veg stage, plants don’t really need that much light, so one Duloc 600 should be sufficient for all of them. Now I’m just going to give this grows a few days to settle in through their new home. I’m going to put up the trellis net to start training these grow. The branches are owned up past the trellis net, now I want to train this grow, so I’m going to grab each one of these branches and push them underneath the net. I was also planning on watering, but the plant is so bushy I can’t even get to the soil, so I’m going to trim this grow up. The leaves at the bottom of the plant they’re no use anyway and they tend to eventually die off if they don’t receive enough light, so today I watered with a compost tea I made and I used Extreme Gardens Extreme Tea as a base, I added farmer's pride grow for a nitrogen boost, liquid seaweed, molasses the pH was naturally 7.0, so I left it at that. The plants are doing great, the training is going great there’s still a lot undergrowth, but I’m going to use a lot of branches for cloning. The plant has grown pretty far up past the trellis, so today I’m going to add a second trellis the square hole on the first trellis is 6 inches the second trellis is going to be 3 ½ inches. So today I’m going to take some clones and I’m going to switch to scroll over the flower. So these lower branches are not going to make it to the top of the plant and they’re just wasting the plant's energy. So let’s put them to good use. I’m going to be using a pair of titanium coated shears and I got a quarter of RO water to put my clones once I snip them off the plant. I’m also going to use cloning extruding gel. I took a total of 16 clones, 12 in the cloner and 4 in Rockville. Alright, so I took my clones now I’m going to switch out the light over to lowering spectrum and I’m going to switch my life cycle to 12:12. Flowering - we’re already starting to see buds forming. Today I mixed up a batch of compost tea using Extreme Gardens - Extreme Tea as the base I’m also adding liquid seaweed, farmers pride grow and I’m adding molasses into the mix, the pH is naturally 6.97. I didn’t adjust it I gave it to the plants that way. So the next 3 weeks is going to be a stretching period and if you’ve never grown before you should expect to see your plants double or triple in size during this time. So I’m just going to continue to train them underneath the trellis until I see the flowers start to fatten up a little bit which is usually the middle of week 2 or week 3, so I took some clones about 7 days ago and threw them in a turbo klone ... I’ve been keeping the root zone around 72, 73 degrees the pH around 5.8, so today I noticed that some of the cuttings already have roots. The flowers are developing nicely, so today I’m going to trim up my plant, but people call this lollipop and they usually do it in veg state, I’ve always done it in flower and I’ve never had a problem. Flower it’s really amazing how fast these plants grow .... I’m running the Duloc at half power right now, my temperature is around 75, humidity around 49 and flowers are developing quickly. The flowers are really starting to fill in now. I got the Duloc on full blast mode and the flowers are loving it. We got hit with a crazy storm in Southern California and the humidity has been off the charts, so I ended up getting a humidifier both temp and humidity have been holding steady since, only downside is my soil is drying a lot quicker now. Flowering .... the plants have pretty much stopped growing laterally and they’re going to put all their energy into creating trichomes and fattening up from this point on. My carbon filter has not been connected this whole time, but the plants are really starting to smell now, so today I’m going to hook this up. The soil is a little dry today, so I’m going to water using liquid seaweed and molasses mixed into a gallon of water and pH to 6.8. Flowering ..... the plants is starting to thicken up a little bit, the trichome production is also coming along. The soil is a little dry, so we’re going to have to water today, but before we do that I’m going to add some store bought compost and also 2 tablespoons of flower girl, ....now I’m just going to massage it and work it into the topsoil. I’m going to get this all nice and damp by adding liquid seaweed, molasses in RO water and pH down to 6.8. 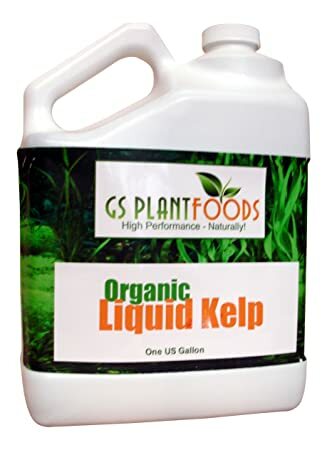 I made a batch of compost tea about 2 days ago this stuff is loaded with good bacteria ready to eat up all that good organic matter I just put in I’m going to add 3 quarts of this good. Flowering for the pistil have already started to turn colors, but she still has a lot of growing to do the soil is a little dry, so I’m going to water using liquid seaweed, molasses in RO water pH to 6.8. At this point the plants just packing on trichomes and we’re just waiting for her to get done. I’m also growing lemon OG in this room, so if you want to check that out you can click right there. I really just concentrating on keeping my temperature and humidity in the right range. The weather’s been nice in Southern California. The highest temperature I’ve had in the tent is about 78 degrees and the lowest nighttime temperature is about 65. The Dulux doesn’t put out that much heat, so I haven’t had to use my air conditioner at all for this grow. RO or reverse osmosis water is a fancy way to say filtered water. The soil is drying up a lot quicker now, so I’m going to water her today, plain RO water. I’m not going to mix anything in, I’m not going to pH it and I’m going to let about 20% run out the bottom. The soil is dry again, I’m going to water using plain RO water. I’m not going to pH, I’m not going to add anything to it, I’m going to let 29% of that water run out the bottom of the pot. Some of the leaves are starting to fade, so we're getting close. The buds are looking really frosty the soil is dry again, so I’m going to water using RO water plain, I’m going to let 20% run out the bottom again. The flower today is harvest day now, the Blue Dream could have gone one more week, but the lemons in this tent were done, so everything’s going to come down. You know, I probably could have squeezed a few more grams out of this plant if I let it go for one more week, but I checked the trichomes and they look good, so I’m satisfied. Now this plant is really bushy and I wish I could have trimmed it a little better, but because of the location of the tent. I really didn’t have access to a lot of the plants, so I cut down all the plants, but since I dry in the same tent that I grow I have to clean this bad boy up before I can hang them out dry I’m also going to disinfect with Clorox and this stuff kills 99% of all germs and bacteria. Alright guys, so I’ve always wet trimmed and dried on drying racks, but this time round I’m doing one plant on the rack and the rest are getting hung whole. Alright, so it’s been 15 days since we harvested. The flowers have been curing in the 8 liter C-vault and this thing is great ... you know I didn’t know how I felt about it when I first reviewed it, but now that I’ve had the chance to use it this things pretty awesome, it's convenient, it seals airtight it doesn’t let any light in and it looks good. I didn’t use humidor packs this time around I just didn’t see a need. If this harvest last me a few weeks I’ll probably put one in this, so it doesn’t dry out. The total harvest weight was 172 grams from one plant. Aroma is crazy it smells almost exactly like a blueberry cheesecake. The dried flowers are big, dense and heavy it produces many trichomes as some of my other plants, but the taste and the high makes up for this. Turned out to be indica dominant. MMJDoctoronline Notes: You don't need a license in California or Nevada to buy and grow up to 6 plants. But, if you want to buy cannabis from a dispensary, you need a licensed medical doctor's recommendation for medical marijuana. The online process to get a 420 evaluation and recommendation is easy. It takes only a few minutes to answer the questions about your conditions and symptoms, any your Cannabis ID can be mailed today. Our documents are used at dispensaries, delivery services, cooperatives, and other access points. Come 2018, your medical marijuana card entitles you to be tax exempt, and save about $15 on every $100 purchase.